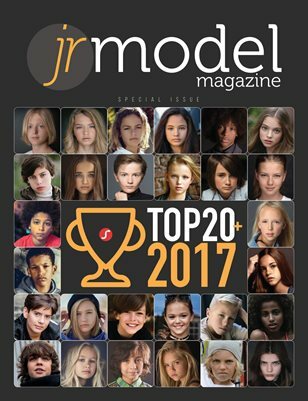 In this special issue, we decided to feature top 20 models of 2017. In fact, it is more than 20 models because it was so difficult to select only 20 out of 90 models published in 2017! That is why previously announced 'TOP20' issue became 'TOP20+' issue. The first six models come directly from our six covers: Kye, Samantha, Patrick, Paris, José, and Isabel. The next 22 models comprise of two groups - 18 models, selected by our readers (yes 18, instead of 14! ), and 4 models picked by an editor (editor's choice). There's no internal ranking in the list; all models are listed in alphabetical order by their first name. A list of 11 boys (Alec, Anthony, Bradyn, Bryan, Jay-Donell, Jenk, Kirill, Knox, Leandro, Semih, and Thyn) alternates with a list of 11 girls (Aleksandra, Alexandra, Alisa, Elise, Emily, Emma Lou, Grace, Madyson, Mirre, Monique, and Patrycja).